This looks to be an ichneumon wasp, and by the coloration and body shape it resembles an ichneumon wasp I saw in the genus Exetastes. However, my batting average for hitting ID's on bugs is pathetic so I look forward to hearing what it really might be. 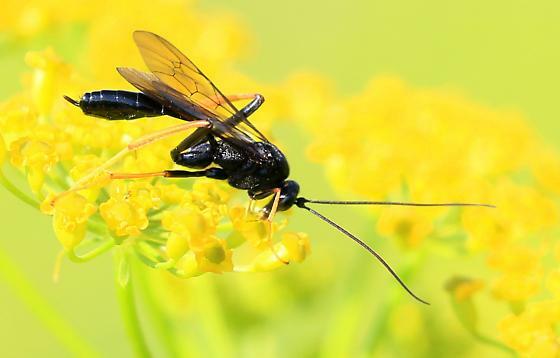 Thanks for helping with this wasp ID, Ken! You nailed it. This is an eastern species that ranges west geographically to Illinois and Manitoba in Canada, but it doesn't surprise me that it appeared in your area in eastern Iowa since its only known host, the goldenrod hooded owlet caterpillar, is also present there. Thanks so much for your ID help here, Ross! Wow, I finally got one right! I had looked at the distribution for this wasp and saw it was concentrated in the northeastern states, with an outlier in North Dakota. I will have to watch for that goldenrod hooded owlet caterpillar in 2019, since I have found and photographed the adult moth here in Winneshiek County.